Our Minimally Invasive Gum Grafting ensures your gums will look like new! You’ve heard the expression “long in the tooth,” meaning getting on in age, and it’s true that nothing ages a face more than gums that have receded. In modern times people don’t have to live with their receding gums and can undergo gum graft surgery to cover the exposed tooth roots. Root surfaces are softer than tooth enamel and so are more prone to erosion and are more sensitive to heat, cold and even sweets. They can get so worn that the teeth loosen or break. Gum grafting can also be used to treat gums that are too thin. Thin gums can’t support a tooth properly and will eventually lead to gum recession and bone loss. Dr. Henriod is an expert in minimally invasive gum grafting techniques. Dr. Joel Henriod & Dr. Tyler Hendry bring to our practice a deep specialization in minimally invasive gum grafting. Known throughout the U.S. for his expertise on gum grafting, Joel Hendriod is a sought-after lecturer and trainer of dentists on this treatment, as well as a preferred periodontist for dentists to refer patients for gum grafting. Start on your road to rejuvenated gums with a free consultation with Dr. Henriod or Dr. Hendry. We will evaluate the extent of the gum recession, creating a map of where the gum line has receded. Traditional gum graft surgery is a lengthy and painful procedure. However, with new advancements, Drs. Henriod and Hendry can repair your gums with a fast and comfortable minimally invasive procedure known as microsurgery. Our doctors use illuminated microsurgical instruments to perform precision surgical procedures. Microsurgery uses small instruments with illuminated microscopes. This means small incisions with far less suturing needed and far less discomfort post-treatment. Instead of cutting into the gum, our doctors create a small tunnel in the neck of the tooth in which to insert the gum graft. One recent development in gum grafting for receding gums is the Pinhole Surgical Technique. Both Dr. Hendry and Dr. Henriod are trained in this technique. With the pinhole technique, receding gums are treated by shifting the gum tissue over the exposed roots through minute pinholes, and stabilizing the gums in position with collagen or gum graft. Learn more about Pinhole Technique. Microsurgical techniques make our gum grafting minimally invasive. We only need to use local anesthesia, although sedation is an option for long appointments and for patients who are anxious. No prescription medicines are needed after treatment, just over-the-counter pain killers for a couple of days, if the patient so chooses. Treatment varies according to which type of gum grafting is decided upon, but all treatment follows the below basic steps. With microsurgical gum grafting we can obtain the gum tissue we need the same day as the gum graft. In some cases we will use donated gum tissue or synthetic tissue, such as collagen in the Pinhole Surgical Technique. 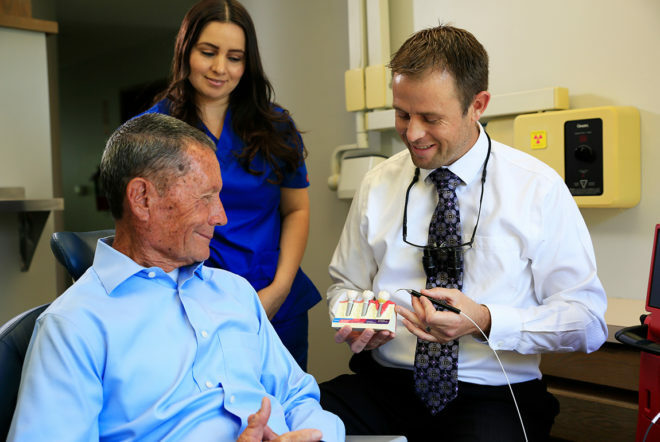 We use a special illumination & magnification to view the inside of your mouth. This allows our doctors to use small instrumentation and thus they need only make tiny incisions. It also increases the field of vision, providing more accurate and successful surgery. In certain situations we use plasma-rich growth factors (PRGF) from the patient’s own blood to boost healing. Post treatment, most people take a couple of doses of over-the-counter pain medication for a day or two. We like to see our patients for three follow-up visits over a period of three to six months. We use four main ways to obtain gum graft material. We decide which to use based on the condition of the patient’s gums and teeth as well as the patient’s own preferences. Traditional Gum Grafting uses the patient’s own connective tissue from the roof of the mouth. Using the traditional method of gum graft surgery, an incision is made to collect the tissue as gently as possible. Sometimes a special roof of the mouth cover is made to cover the incision line. Traditional gum grafting procedures usually take several weeks to heal. Our minimally invasive, non-surgical methods allows for almost immediate healing. Using micro surgical techniques, we can harvest the needed tissue from the roof of the mouth using the “trapdoor” method. This is done by making a small incision in the roof of the mouth, which is then sewn up. The incision heals in one to two days and only over-the-counter pain medication is needed, if at all. In some cases our doctors opt to use donated sterilized human tissue. This is especially useful for patients sensitive to any type of surgery. Collagen use in the Pinhole technique. Collagen is the main structural protein found in fibrous tissue such as skin, ligaments and bone. It provides elasticity and strength. The Pinhole Technique does not require a tissue graft other than the use of collagen. The patient’s existing gum tissue is repositioned (not cut) to cover the exposed tooth roots and collagen is used to stabilize the gums in their new position.